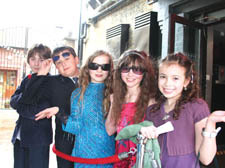 TOMORROW'S film-makers and thespians starred in their first premiere at the Everyman cinema in Hampstead yesterday (Wednesday). Reception class to Year 6 students from Christchurch Primary School collaborated with SPLATS, a children’s arts company, to create narratives and film video diaries as they became directors and actors using filming equipment. Their movies were mainly shot in Christchurch Hill, Hampstead.